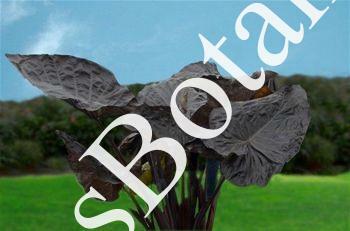 Colocasia Black Goblet is a dark purple to black Colocasia with shinny foliage and cupped up leaves. This looks to be a cross between Colocasia diamond head and Colocasia Thailand Giant. The plants can grow 4 to 5 feet tall. Leaves will catch rain water after a shower. Plants sold in 4 1/2 inch pots. Similar to Colocasia Black Swan and Colocasia distant memory.